The much-awaited iPhone 5S will launch in July while pre-orders in Japan will kick off June 20. At least that’s the timetable revealed in a leaked document from Japanese carrier KDDI. However, there are no details about the equally celebrated iPhone 6 that is set to debut concurrently with the iPhone 5S this year. 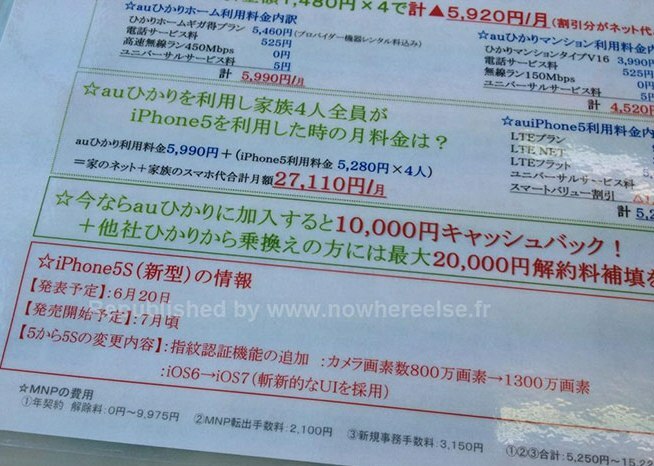 The document, leaked to French tech blog Nowhereelse that has been tracking the development of the next-gen iPhone, shows details about the price and other key information about iPhone 5S, including the iOS 7 operating system and NFC availability. As in the past leaks, this one should also be taken with a grain of salt as the document can be easily replicated, although it bears a company logo that can somehow attest to its veracity. The document, furthermore, resembles existing product and pricing documents among mobile phone distributors and carriers in Japan. Looking at the scanned document, it is noticeable that the iPhone 5S, starred and printed in red, appears to be set for a pre-sale announcement on June 20 while it would start to hit store shelves by July. The information at the bottom, when translated, says the smartphone has elevated in features from the predecessor iPhone 5. iPhone 5S appears to include a fingerprint reader, 13MP camera and iOS 7 operating system. On the other hand, the green characters of the document talked about details of the iPhone 5, including its monthly plan rates, LTE flat rates and subscription options. The leaked document emerged at a time when Apple’s Worldwide Developers Conference is inching nearer to take place from June 10 to 14, a week before the rumored release of the iPhone 5S. Looking from that angle, we can say with great certainty that the KDDI document is holding some traces of probability this time. However, Apple CEO Tim Cook previously said that the company might surprise the public with a new product (though there’s nothing really surprising with iPhones nowadays) for fall. Previous reports also suggested that Apple would unveil the new iPhone on August. i am waiting for it hope this time they will not disappoint me.